Stephen and Ines Muir, each now with over thirty five years experience in sourcing, buying and selling quality antiques, had their major business based in London. We have been based in the well-known antiques town of Tetbury, in the glorious Cotswolds for over ten years now, and are about to celebrate six years in our own shop at Long Street, Tetbury, which showcases our theme of mixing good contemporary design with selected pieces from the 20th Century. 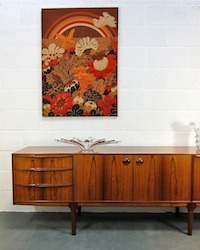 We also sell retro items and English and European antique items. MUIR ANTIQUES to advise it's General Terms and Conditions, but Distance Selling Regulations apply. 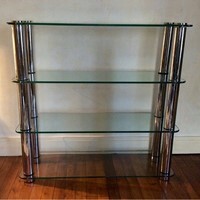 Etagere with Large Diameter Chrome Tubes.